Registration for the two NCSM Fall Seminars opening soon! If you have only one day to spare for your professional growth, consider spending that one day with NCSM on on of the two fall seminars scheduled for this fall. November 28, 2018 in Seattle, WA at a location in downtown Seattle, WA TBD. Both leadership seminars will have a theme around Building Mathematics Leaders: Coaching. The focus will be to help each participant become the agent of change and improve student achievement in mathematics through the vehicle of classroom and district coaching. Other benefits of attending include learning about research-based strategies using expert resources in mathematics coaching; networking with leaders from other regions, states, and countries; and developing a plan for yourself or your district to focus your mathematics leadership in coaching. Look for more information in the near future on registration and logistics by clicking HERE. Stay tuned for Registration Information for the 2019 NCSM Conference in San Diego, April 1-3, 2019...coming soon! Join us for the Collective Call to Action's next book discussion for August-September. A webinar will be held in September 2018 (date TBD) and will be facilitated by the Association​ ​of​ ​Mathematics​ ​Teacher​ ​Educators​ ​(AMTE)​. Continue your readings and reflection over the summer with educators from around the country and possibly the world as we continue our work From Awareness​ ​to​ ​Action:​ ​Equity​ ​and​ ​Social​ ​Justice​ ​in​ ​Mathematics​ ​Education. The readings and reflection questions provide a focus as you study, reflect, and contemplate the action(s) you will take as you continue your equity walk. Each month’s reading is now for two months followed by a webinar. We look forward to our year of learning together. View the list of articles and books for the 2018-2019 learning and visit the MyNCTM community to join the online discussion forum. Drs. Doug Clements, Julie Sarama, Holland Banse, Crystal Day-Hess, and Candace Joswick at the Marsico Institute for Early Learning and Literacy and the James C. Kennedy Institute for Educational Success (University of Denver) are working with colleagues from around the world to complete an international comparison of pre-school teachers' educational and pedagogical beliefs in the field of mathematics. Their charge is to gather survey data from the United States. You are invited to complete a survey if you are a pre-service or in-service teacher of children aged 3 to 6 years. The survey may be accessed HERE. Please share with others. Pat Baltzley is pleased to be NCSM's eNews Editor. Please feel free to contact Pat with news, feedback, or suggestions. This is a quote from Susan Vobejda, a chief marketing officer, talking about leadership in her field. I believe this statement applies to more than just marketing and business. NCSM is about mathematics education leadership and bold leadership is needed at every level of education. As mathematics leaders, we are focused on helping those on our teams find success. We know it is not about us and it doesn’t hurt to be reminded of that when the stress of a new school year surrounds us. As you begin the new year, have you ever thought about what kind of leader you are and how your team sees you in that role? It is a challenge to keep everything moving as we start the year. It does not matter whether it is your first year or your thirty-first year; we feel the pressure. Most of the almost 100 coaches that participated in the NCSM Summer Leadership Academy, Building Mathematics Leadership: Coaching, will be starting their new school year. The feedback from the academy tells us these leaders gained additional tools to use with teachers as they head into a new year. I heard many great ideas and plans from coaches at all levels - the networking was phenomenal! We will continue to build leaders and focus on coaching with two fall seminars. If you did not get the opportunity to join us this summer, please consider joining us this fall. More information can be found about these two seminars in the news article in the column to the left. 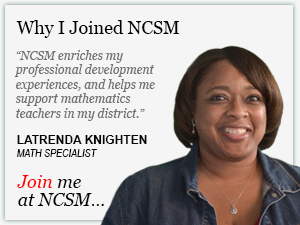 Last month I discussed some of the benefits of an NCSM membership. As I shared in my message there will be a video introduced here each month to highlight these benefits as found on the NCSM website (https://www.mathedleadership.org/). The video tour for this month features the Jump Start modules available through the website. Shawn Towle, Eastern 1 Regional Director, created this website tour. Watch the results of his hard work by clicking HERE and look for more video tours every month in the eNews. I wish you success as you lead, in whatever capacity you serve, so that we make a difference in the mathematics education for each and every learner. Your membership must be current as of August 15th - today - to be able to vote in the election. Make sure your email information is correct and your membership is up to date. To check on your membership status and to renew if needed, click HERE. Watch for the voting announcements in the mail and online; you should receive a postcard with voting instructions in mid-August. Voting will begin on September 15th and end on October 15th. Remember, NCSM is depending on YOU to VOTE in the upcoming election. All voting is online and requires only a few minutes. The following NCSM awards are opened for nominations now. Consider nominating that special mathematics leader who inspired you and is the reason you yourself are a mathematics leader today. Kay Gilliland gave her time, energy, services and skills to work for equity in mathematics education for all students, especially low-income, black, Latino, and indigenous peoples. Each year NCSM honors her legacy by presenting a person of like mind and work ethic with the Kay Gilliland Equity Lecture Award.The awardee will be invited to present their lecture at the 2019 Annual NCSM conference in San Diego, California in April. Please visit HERE for more information on the Kay Gilliland Equity Lecture Award and to nominate a candidate for this award. Nominations are open through October 1, 2018. Colleagues across the nation are engaging in significant work to further ideas and passion regarding mathematics leadership and education. Please consider nominating a person you know who has made significant and describable contributions to the field through a dedication and concern for his/her fellow mathematics educators. This person should demonstrate a clear knowledge of mathematics education as well as contributing to the furthering of the stated purposes of NCSM: the interchange of ideas, cooperation with other professional organizations, and leadership in attacking current problems in ma2018 thematics curriculum and supervision. Please visit HERE for more information on the Ross Taylor/Glenn Gilbert National Leadership Award and for a nomination form and criteria. Nominations are open through November 1, 2018. The following NCSM grants are opened for applications. Consider them for yourself or share them with a school or mathematics leader who you know might be interested. The purpose of this grant is to provide professional learning assistance for mathematics teachers and mathematics teacher-leaders. For 2018-19, a grant of a maximum of $4000 will be awarded to an elementary, middle or secondary school. The professional learning is for mathematics teacher-leaders and/or mathematics teachers within a school or district. Professional learning must focus on one of NCSM’s signature initiatives, Formative Assessment, Digital Learning or Access-Equity-Empowerment. Please visit HERE to apply for a Teacher-Leader Professional Learning Grant. Applications are open now! The deadline is November 2, 2018. Do you serve in a mathematics education leadership role? The 2019 Annual NCSM Conference will take place in San Diego, California in April 2018. If you are a current NCSM member (as of November 1, 2018), and have not had the opportunity to attend this outstanding conference focused on cutting edge topics in mathematics education in the past three years, you are eligible for one of the Iris Carl Travel Grants. Please visit HERE to apply for an Iris Carl Travel Grant. The deadline is December 1, 2018. If you are an NCSM member and have attended the annual conference before (and loved it), find a colleague who is (or will become) a NCSM member by November 1, 2018 but has not attended the annual NCSM conference, and share this awesome opportunity with them.